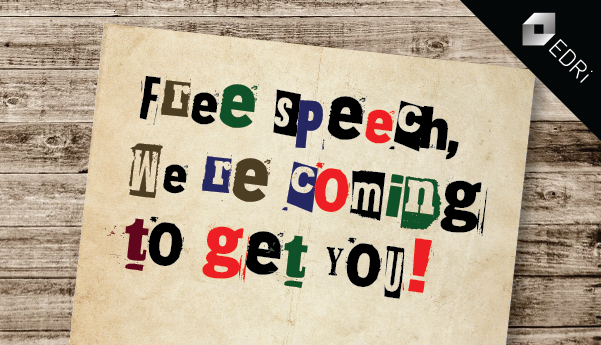 Germany: Will 30 June be the day populism killed free speech? On 30 June 2017, the German Parliament will vote on the bill on “Enforcement on Social Networks”, also known as the “NetzDG”. This draft law, if adopted, could seriously impair human rights online, including freedom of expression and opinion. That is why we tirelessly explored different ways to make sure the European Union (EU) would take action against it. We joined forces with other civil society and industry associations and submitted formal comments to the Commission. EDRi and its members were not the only organisations to raise our voices against the NetzDG. The United Nations Special Rapporteur on the Promotion and Protection of the Right to Freedom of Opinion and Expression David Kaye, other civil society organisations, industry, academia and even the legal services of the lower house of the German Parliament, the Bundestag, issued comments against the proposal in Germany. On 19 June 2017, there was a Parliamentary expert hearing at the German Parliament. Out of ten experts consulted, eight were very critical towards the draft law. Five of them said that it was incompatible with German constitutional law. On the very same day, however, European Commission Vice-President Andrus Ansip stated in Brussels that Germany had notified the Commission that it had made some corrections where there were legal questions. Therefore, the Commission was not worried, trusted the implementation would be perfect, and that the authorities would not misuse the legal provisions. He said that if other Member States were to decide to have such approach and if some paragraphs went against EU law, then the Commission would intervene. The version of the draft law that will be put to the vote on 30 June is somewhat different from what was originally proposed. However, it appears that the outcomes will be no less damaging. For example, the mentions of content filters are removed. Nevertheless, the draft law now asks for the creation of a new “self-regulatory” authority that will be paid for by companies. Under the law, social media companies would make referrals to the “authority” if they are not able to determine whether content is illegal or not. The text is very vague on how this privately-sponsored “authority” will function. It is unclear about its transparency, its oversight, its accountability, which cases could be submitted to it and which criteria will be used to check whether content is illegal or not. In practice, the draft will keep promoting “voluntary” measures by private companies to take down contents, with liability rules that incentivise such restrictions, without them being obligatory. This means that the results will be similar to those of the original proposal, but just more difficult to challenge in court. In the current version, upload and content filters would not be mandatory, but whether or not mandatory, they are likely to be applied by big companies like Facebook. These companies are, quite rationally, driven by the motivation to avoid liability, using the cheapest options available, and to exploit the political legitimisation of their restrictive measures for profit. This can only lead to privatised, unpredictable online censorship. In other words, it seems that politicians are determined to continue to ramp up populist demands for profit-motivated companies to become the executive, the legislative and judicial powers of the internet. We are disappointed at the European Commission for not issuing a legal opinion asking Germany to drop the draft law. The European Commission had legal duties to take action to protect citizens’ interest. It failed to do so. It is not just the Charter of Fundamental Rights of the European Union that the Commission had promised to respect, but also not to “seek nor take instructions” from Member States. It is a pity the European Commission appears to have chosen politics over legal obligations. We can only assume that it is a coincidence that the Commission failed to act against an illegal proposal from the largest EU Member State, while saying that it might take action against other Member States that would propose similar measures. We urge German Members of the Parliament to vote against the draft law on 30 June. This date should not be remembered as the day that populism killed the freedom of expression. The impact of this law is not confined to Germany. Unfortunately, other countries, such as the United Kingdom and France, are replicating this approach. The European Commission has failed to respect its legal obligations. The German Parliament can still deliver.